Organized in collaboration with the Catalunya La Pedrera Foundation's Teachers and Science Programme and the Barcelona Science Park. This course addresses subjects such as protein-protein interactions, the role of peptides as shuttles to transport drugs into the brain, and the development of nanoparticles in the biomedicine of the XXI century. The course will include various topics covered in the secondary school study programme: proteins, drugs, cancer and brain diseases, and the ethics of animal experimentation. 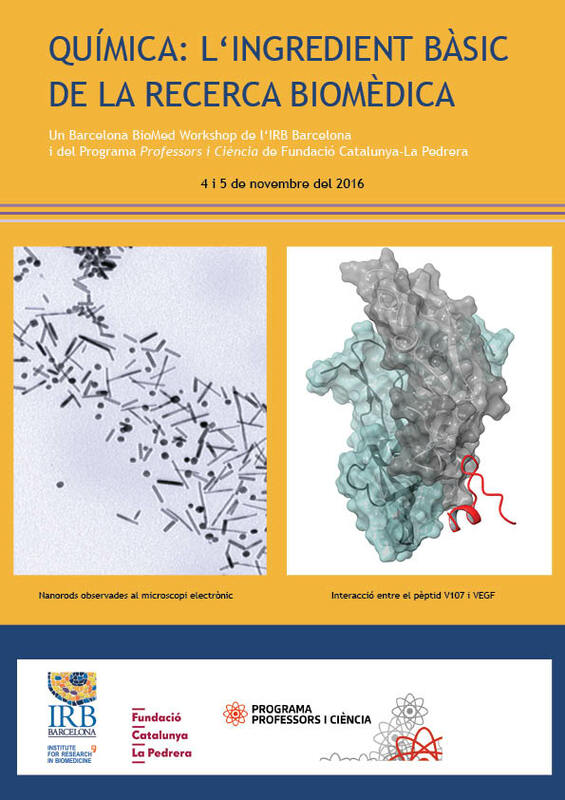 This initiative also provides a unique opportunity to bring together scientists from one of the most important research organisations in Barcelona and secondary school teachers in Catalonia in a research setting aimed to delve into questions posed by biomedical scientists, thus allowing the teachers to learn about the methods used in day-to day research activities. During the course, scientists and teachers will work together to develop and perfect educational material and resources that can be used in the classroom. Scientists and teachers will be encouraged to build communications channels and networks to be used once the course has been completed. This 2-day course is split into two parts. In the first, chemists and pharmacologists at the forefront will present a general view of current knowledge on the development of new drugs and will talk about why chemistry is such an important tool for understanding and conserving human health. The second part of the course will focus on the tools used to study and identify peptide compounds that can act as brain drugs, on how a peptide is designed to be resistant and to reach clinical practice, and on how therapeutic potential is studied. These subjects will provide a practical understanding of the chemical and pharmacological techniques that researchers use to develop drugs with particular characteristics. Learn about protein-protein interactions and about how studying and modifying them can bring us closer to new therapies. Become familiar with some of the most cutting-edge approaches used to improve drug delivery into the central nervous system. Perform experiments to understand the potential of nanoparticles for the biomedicine of the XXI century. Consider the impact of basic research on modern medicine. You can register directly on the web of the Catalunya La Pedrera Foundation's Teachers and Science Programme.